The Health and Safety at work Act 2015 was passed into law (4 April 2016). This Act has thrown into to doubt the liability of Orienteering clubs when they carry out their activities. Many landowners and event partners, Local or Regional Councils, and landowners/managers (all of whom are PCBUs) may carry out due diligence and ask clubs to provide evidence that they have taken all reasonable and practical steps by way of a Health and Safety Plan, to keep everyone involved (participants, mappers, organisers, and public) safe. This Safety Management Plan is designed to assist clubs to carry out their obligations and provide ready to use templates for day to day use. What do you do if there is a lost child, a major injury, or a serious illness? What strategies does your club have in place if these incidences happen, and how can we prevent them from happening now and in the future? These questions are answered in the Safety management plan. We hope this system will provide a standard system all that clubs will use to make it easy to carry out our sport safely. The Harm form is the core of the ONZ Safety Management Plan. It provides all the base information required for event safety. It is the go-to document for event organisers. It lists hazards and management strategies where there is a risk of significant harm. Click this link to view reports of incidents eg Missing Children, injuries. This is the comprehensive plan. It provides ONZ an audited and structured plan to comply with the Act. 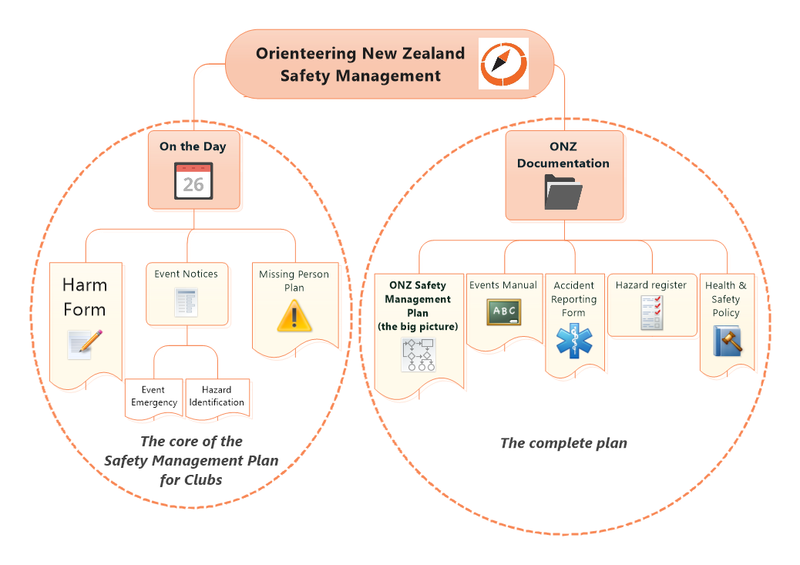 If your club would like Risk Management advice, or you have comments on the ONZ Safety Management Plan, please contact Russell Higham; events@orienteering.org.nz.